Last winter, I met several serious iPhone users who made the switch from iOS to Windows Phone. I was very suprrised to see this happening, but it seemed to possibly be a fluke. Since the release of the Nokia Lumia 920 with Windows Phone 8, I'm finding out that this is a slight trend, not a fluke. iPhone owners tend to be the most brand-loyal users of any smartphone brand. That's why it stops me dead in my tracks wondering what is going on when I see a dyed-in-the-wool Apple fan making such a tremendous switch. And whey they do, they don't look back. What could possibly be the cause for this to happen? It's quite simple, actually. After polling several new Lumia 920 owners, here's what I found out. The first and most common reason mentioned by iPhone owners who made the switch is the simplicity of Windows Phone 8. For them, Microsoft's smartphone operating system environment is easier to pick up and function than iOS. They say that it is far more intuitive, and a break from endless icons and folders. Another big reason former iPhone users made the switch is the Windows Phone 8 start screen and its live tiles. They say that the tiles show the user all the important things going on in their world without the need to dive into several different applications. They can customize the order of the tiles, and even the size and color to fit their needs. According to the Live Tiles fans, they love the ability to monitor and respond to all social network conversations all from one single start screen for their favorite friends. The ability to even use apps like Skype to answer calls without opening the actual application is a huge plus, thus allowing them to stay on the home screen or within a certain running app they are working with. The third and final most common benefit that I have heard from the Nokia Lumia 920 owners is the advanced features built into the camera that you don't get with an iPhone. The Carl Zeiss camera is said to have the best functionality, plus extra features like the ability to add filters similar to Instagram. Plus users can use pinch-to-zoom within the camera app, plus "Smart Zoom" which lets them take a pile of pictures and erase people or objects from the scene. Keep in mind, this is not a significant trend. There will still be millions of iOS users that will never make the switch. But for the small minority of professionals that work in telecommunications stores that are making this switch, it is a tiny but significant trend that could spell possible success for the future of Windows Phone 8. What is your opinion? Are you a former iPhone user that made the switch? What were your top reasons for changing over? Or is it possible that you are a Windows Phone user that switched to iOS? I'd love to hear your story! 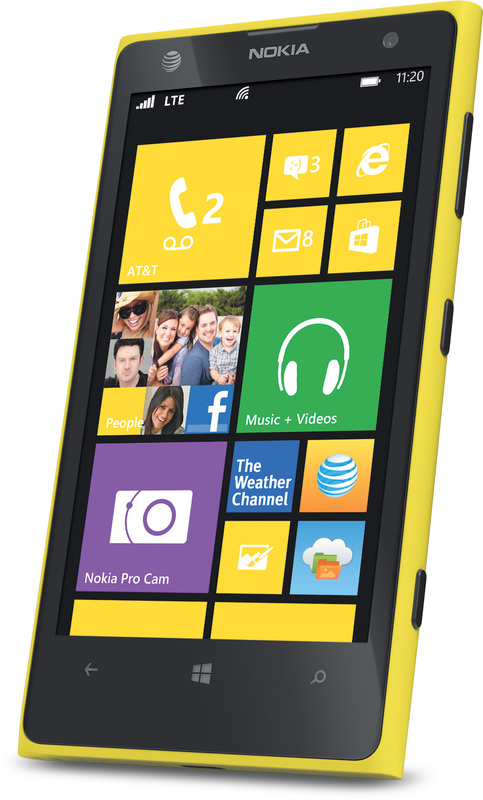 GET THE NOKIA LUMIA 920 FROM AMAZON WIRELESS FOR AS LOW AS $19.99! Check out the Nokia Lumia 920 at Amazon Wireless and pick up a new handset for as low as $19.99 with a 2-year contract agreement through AT&T Wireless! Is The Nokia Lumia 920 The Future Of Smartphones? NOKIA LUMIA 920 HITS THE SCENE - IS THIS THE FUTURE? Folks, you might as well get this straight in your mind right now... Nokia and Microsoft will be putting a major dent in the smartphone market in the next year. Mark my words. The Nokia Lumia 920 shocked me when I first held it in my hand. I had the opportunity to review the previous Lumia 900, and I was impressed. But the Lumia 920 has gone above and beyond the call of duty. This is by far the best new concept for a smartphone on the market today. But the reason that this smartphone will conquer the market is not just due to the quality build and fantastic functionality. With an entry level contract price of $19.99 on contract, Microsoft and Nokia will cause serious heartburn with the competitors on the market introducing smartphones at the usual price of $199.99. If you know me by now, you know that I'm a huge fan of Android and Samsung. I am a previous iPhone lover who made the switch to Android in 2011. I still currently own an Android device, the Samsung Galaxy S2. And I love this handset. But after spending 10 minutes talking to an AT&T sales associate in Ohio, my mind has changed about the future of Nokia in the smartphone market. The rep who let me check out his sleek new Nokia 920 informed me that he is a recent iPhone convert. He loves his Lumia, and he doesn't plan to ever look back. Why is the Nokia Lumia 920 turning out Android and Apple customers? It's due to the build of the phone, which is solidly the slickest and most aesthetically pleasing of all smartphones I've seen. Additionally, it's the operating system. Microsoft has hit it big with Windows Phone 8. It's far more intuitive and impressive than Apple's iOS and also Android 4.0. The action of the live tiles makes it easy to access all of your social media content without jumping in and out of apps, plus it's easy to get to all of your utilities. The Nokia Lumia 920 has a fantastic 4.5" PureMotion HD and ClearBlack display that blocks incoming light reflections through a polarized layer to improve screen visibility under direct sunlight. I've never seen anything like it. It's the perfect size, and a glorious visual wonder. The camera on the Lumia 920 is quite possibly the best on the market. It's a Carl Zeiss brand 8Mp dual LED flash camera with a front facer for video chatting. The quality of the pictures taken with this camera is a force to be reckoned with. I won't drone on about all the techy details of this phone, but it's just super fast and efficient. It's the right combination of cutting-edge combined with affordability. They've definitely hit a sweet spot. There's no lag in loading apps and jumping from one to another. I have yet to test out this device, but you better believe a full CZ Blog review will be forthcoming when AT&T Wireless of St. Louis hooks me up with a test device. Stay tuned and watch out. And watch as this phone blows up the market over the next year. When I recommend a smartphone to people who have never owned one in the past, I confidently tell them that a handset with the Windows Mobile 8 platform would be the easiest and best to get started with. There's no question. Even though I am in neck-deep with Android at the moment, I don't know how long I will be able to hold out before making the switch to Windows Phone 8. Once I get to the point where 90% of the apps I need are available for Windows Phone, I'll probably be jumping ship. You heard it first right here on the CZ Blog. OFFICIAL CZ NOKIA LUMIA 900 SMARTPHONE REVIEW! Okay folks, this is overdue. I had a 2-week long test period of the Nokia Lumia 900 smartphone (AT&T) and ran it through the ringer. Here's my official word on this device, and the Windows Phone Mango platoform! Despite all of the reviews both positive and negative about this device, I am here to report to you that it gets an overall passing score, and my thoughts about the future of this device and Windows Phone Mango are still as positive as ever before. First of all, I'll tell you that Windows Phone Mango is a breath of fresh air. It's not the same old mobile platofrm that we have seen for the past 3 years with Android and iOS. It's a "whole-nother" ball of wax. I picked up the phone right out of the box, and was able to understand how to navigate around instantly. The Windows Phone Mango system on the Nokia Lumia is smooth, efficient, and super-intuitive. I didn't need to pull out the instructions to figure out how to operate the phone. Microsoft did a fantastic job in starting from scratch when they ditched Windows Mobile 6.5 to create the new platform. Because of the ease of use, I see the Nokia Lumia 900 as an excellent choice for first-time smartphone buyers. I have told more smartphone newbies to look at the Lumia than any other device. It gets completely away from the old way of jamming hundreds of icons on a screen. Knowing that 50% of the population still does not own a smartphone, I would say that all of the predictions of the Nokia Lumia 900 and Windows Phone Mango making a huge dent in the smartphone market over the next few years is absolutely true. The future of this device looks bright. But getting back to the operating system, there are a few things that I absolutely love. First and foremost, the Live Tiles. Everything you need to get to that you frequently use is located right on the home screen. And you can create a tile shortcut to your favorite things, even people. And what I also love is how all of the social media communities are combined into "news events". Rather than checking Twitter, Facebook and other sites, you get the latest "news" as a notification. Something else that I found extremely useful with the Nokia Lumia is how messaging is aggregated. Instead of jumping back and forth between SMS messages and Facebook messages, for example, they all show up as generic "new messages" on the home screen. This saved me a ton of time. I was able to keep closer contact with all of my friends this way. Some people prefer SMS, while others heavily use Twitter or Facebook. The Nokia Lumia 900 only looks at "current messages" rather than individual apps. That way, I can chat with everyone using their preferred method while only gazing at my home screen. Accessing programs is a snap. If you swipe to the right, you see a verticle listing of all your apps and features, similar to what you get by clicking the "Start" button on Windows 7 with a PC. This was a big plus for me, since I am an avid PC user. But the Lumia 900 is not just for Windows enthusiast. I'm starting to see more and more Apple iPhone users make the switch. As a matter of fact, one of the reps at my local AT&T store switched from owning an iPhone for 3 years to a Nokia Lumia 900, and she said she'll never switch back. A big plus with the Lumia 900 is the solid build of the phone. It's a heavier and more solid-feeling smartphone than my Samsung Galaxy S2, but it's far more durable than a fragile iPhone 4S. The Lumia was built with a solid polycarbon composite body, and Gorilla glass for the display. It will survive drops, and the body of the phone is resistant to scratches because the color is built into the material. The size of the display is 4.3" in diagonal measurement. That's the perfect size for people who dont' want a gargantuan "phablet", but also strain to read on the tiny 3.5" iPhone display. The resolution is 800x480 pixels, and while some gadget reporters complain about this, the average smartphone user will not have a single complaint about it. It looks great for multimedia and pictures, and doesn't have a lot of overkill. Something else that many gadget geek reporters complained about is the single core 1.4GHz Qualcomm cpu. I don't understand the complaiing about this. The software written for the Lumia 900 is not "multi-threading", so it doesn't make a difference that it's not a dual core or quad core cpu. Speed-wise, I challenge any user to notice a real difference. It cuts through apps and functions with ease, and the majority of users won't tell a bit of difference as compared to other high-end smartphones. The cameras on the phone don't just cut the mustard, they actually perform quite well. You have a Carl Zeiss branded lens on the rear 8Mp camera with 3X zoom plus a dual-LED flash, and it takes extremely high quality photos and video. The front facing camera is plenty good for video chatting at 1Mp, and is extremely clear. I was impressed that I had no problems running apps and multitasking with the 512mb of RAM. Most smartphones are packing a standard 1Gb of RAM, but this does not seem to slow down the Lumia 900. It has more of a standard internal memory capacity at 16Gb for storing pictures, multimedia content, and files. I don't know if it was just my excitement about the phone, or possibly that listening to music was a richer, fuller experience than other smartphones that I have tested. I seemed to have less trouble connecting to streaming music services, and using the music and video player was quite smooth. Surfing the net with the Nokia Lumia 900 was also a thrill when running on a 4G LTE service area in St. Louis, but the HSPA+ 4G connectivity was also impressive. My download speed tests had the Lumia competing right in the ballpark of other devices. Making phone calls with the Lumia was as I would expect it to be, and the sound quality when using the earpiece was fairly rich and robust. I'm picky about how a smartphone "feels" when smashed up to my ear, and I didn't seem to have any discomfort when having long conversations. Last but not least, the battery life of the Lumia 900 impressed me. I noticed that the phone would stay charged when leaving it on in standby mode much longer than my Android device. I would put it on par or better than the battery life of the iPhone 4S. Battery drain is a real issue with high-end smartphones, but there's no worry here. At the end of my test period, I was truly sad to see this phone go. When I first got the phone, my Galaxy S2 had experienced a malfunction and would not charge. I was forced to use the Lumia 900 fully. It was a big plus that picking up the new system was as easy as it was. I could go on and on and bore you with more technical details, but I think the people who would consider buying this smartphone just need to know that the Windows Phone Mango system is truly a different experience, and the Nokia Lumia 900 was truly a "fun" smartphone to use. I give it an overall resounding passing grade, and I would recommend this device first and foremost to new smartphone users. But anyone else who is looking for a change of pace should definitely give it a test drive, because I believe that Microsoft will only be offering more and more apps as developers start to give Windows Phone Mango more attention. If you have a Nokia Lumia 900, I would love to hear your thoughts on whether or not you're going to stick with the Microsoft platform! Until then, I better bring this post to a close, because this is the longest article I have written about a new smartphone! GET THE NOKIA LUMIA 900 FOR $49 ON AMAZON WIRELESS! You can own the Nokia Lumia 900 for as low as $49 with a 2-year contract from AT&T through Amazon Wireless! Enjoy the intuitive Windows Phone Mango operating environment with all of the hardware features you expect with a smartphone like 4G LTE internet connectivity, a Carl Zeiss 8Mp camera, front-facing camera for video chatting, 16Mb of internal memory storage, SD card expandabilty, and more! Get it now while the special lasts!